Blackjack-info.net is about to dig a little deeper in order to help you start to play blackjack with more skill than the average Joe. This involves more than just basic strategy, but you should have basic strategy down cold by now anyway. If not, be sure to read up on it and understand that having it 'down cold' doesn't mean having every option's optimal play memorized. 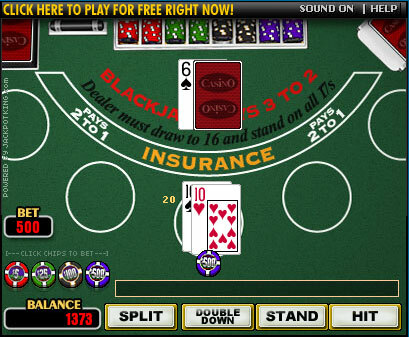 Before I continue, if you're looking to play blackjack online, simply click the image below and enjoy our free blackjack game (with built in chat console). Otherwise, if you're looking to play like a pro, read on below. Consider this situation. You're playing in Vegas and it's just you and one other person at the table, but they are playing multiple hands. What would the advantage be to play blackjack two or three hands at a time? In actuality, it's really more of a difference than an advantage. From a house edge based expectation, there is no difference between playing one $10 hand and two $5 hands. There is a difference though, make no mistake. Where the change is made is in the expected bankroll fluctuation over the course of play. How you take advantage of this added knowledge is by making a decision between little risk with small return or larger risk with larger return; a classic gamblers conundrum. Concentrating on a single spot, as most of us do, brings out the largest fluctuations in our bankroll over the course of game-play. By spreading your bets over multiple games you're effectively limiting the peaks and valleys your bankroll is expected to reach. To present this concept with some proper numbers, I borrow from an Alan Krigman article covering a multitude of blackjack situations. He has calculated out the ranges over which you have a 50-50 chance of finishing 100 rounds with each approach. We assume you are playing with a strategy that gives the house a 1% edge and are using a standard betting amount of $10. If you take that $10 and bet it in one hand consistently, the 50-50 range is from $86 loss to $66 profit. If you play two $5 hands on each round at the same table, your range is from $74 loss to $54 profit. Betting two $5 bets at different tables shrinks the range some more to $64 loss to $44 profit. This means there is a 50-50 chance you will end up with $64 loss or a $44 profit playing $5 hands at two different tables simultaneously over the same 100 rounds. As you can see, how many hands you play at once (relative to a central bankroll) should reflect your approach to the game for that day. One of the vital steps towards learning how to play blackjack like a pro is to disregard advice from so-called professionals in the casino. Not to say there are no pros in the casino, just to say that the ones who are usually don't mention it to you. No disrespect to the nice pro's, but to all of you who only claim to know what you're talking about, and like to share the wealth, quit it. Recommend they check out blackjack-info.net instead! One common refrain you'll hear from the 'folk who have it figured out' crowd is this classic: the dealer wins more often than the player, so just do exactly what the dealer does. Alright! Lovely idea, lets take a proper look. Thinking about it, on the surface yes, it seems like a half decent idea. If I do what the dealer does, and I get paid 3 to 2 on blackjack, that means I should have an advantage. This logic breaks down when both the dealer and player bust. The dealer will bust on average 28.2% of the time, and as a player mimicking the dealer you too will also bust an average of 28.2% of the time. And of course, when you both bust, the dealer always wins. So the player is hurt every time both they and the dealer bust, which happens 8% of the time. That's an 8% disadvantage, staggeringly huge in the blackjack world. Even when you factor in the 2.3% payoff boost for blackjacks, you're still left with a 5.7% house edge. Another often passed along yet unreliable strategy is the no-bust plan. The point of this strategy is to never hit if you have the chance of busting thereby eliminating the possibility of busting from your game entirely. Again, on the surface it seems like it may have some legs. This strategy usually becomes quite attractive after hitting on a hard 12 and busting, only to watch the dealer bust as well. The real problem is that it's too strict. If you play purely to avoid busting, you will be stuck with a low total about half of the time, which isn't worth anything unless the dealer busts. But since you now know the dealer only busts 28.2% of the time, you know that's not nearly enough for this strategy to create a good situation for you. Basic strategy often suggests taking a chance of busting because it increases long-term expectations. To play a no-bust strategy usually means increasing the house edge to somewhere between 5 and 8%. Basic strategy will maximize your advantage; deviation from will statistically make you poorer. Look for games with favorable playing conditions, such as a low number of decks, or dealers who burn through a lot of the shoe. To see exact rule variations and how they affect the house edge look our house edge changes table. Card counting, while an effective technique, is only useful at certain tables (such as the favorable conditions described above) and takes a healthy mental, not to mention financial, commitment. With proper strategy, blackjack's house edge can dip very close to zero. Keep in mind though that it will never reach or exceed zero, so don't expect to win all the time. In the same vein of thinking, if you play blackjack with excellent basic strategy you shouldn't expect to lose all the time either!